The WyzeCam $20 plug and play camera was released last year in October. Now, the team is ready to come up with the updated version, but at the same price. Dubbed as WyzeCam v2, the camera looks similar to its predecessor at first glance, but packs some welcome additions. “The best value all-in-one 1080p HD smart home camera has a hardware upgrade!” the company said in a blog post. Back in October, when the first WyzeCam was launched, it was well received by the experts, who applauded the team for packing essential features in a low-cost piece of hardware. It had 1080p video with night vision along with core features of a security camera such as motion and sound detection, sending alerts while detecting the beep of a smoke alarm. Wyze has also worked towards improving the audio quality of the camera with a Class-K amplifier. “Class-K audio power amplifier and a new audio chip that significantly reduces TDD interference and EMI,” the company says. Further, the upgraded WyzeCam has got a matte finish to reduce reflection, a possible issue with the original glossy finish. 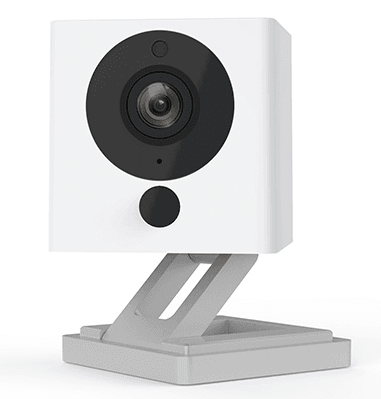 In addition to these, the Wyze Cam v2 also offers mobility to the users as they can take it along to different rooms or record from different spots in the house. This is possible due to the 3-axis design that enables the security camera to spin or rise in any direction. According to Engadget, the WyzeCam v2 would also support Alexa. Although it would not understand all the voice commands, a user would be able to view videos through the video screens on the Echo Spot and Show. An update in March would add Alexa support along with an online automation service – If This Then That (IFTTT). In adding new features, the team has not compromised any of the existing features. The updated version is capable of doing everything that the original Wyze camera did, in addition to the new functionalities. The camera allows users to view and click in real-time, and record videos directly to a smartphone. Users can shuffle through saved motion-triggered alert videos for 14 days. The WyzeCam also uploads the videos to the AWS cloud. Further, a microSD camera can be inserted in the camera to record footage all the time. It automatically overwrites the old storage when the maximum storage limit has reached, notes DigitalTrends. The first version of WyzeCam, which was touted as a cheap alternative to home security equipment, would also be eligible for the software updates. However, it is not clear what features will be added with the updates. The WyzeCam v2 is available for preorder now at $20. The device is expected to be shipped the last week of February. However, going by the past trend, the camera won’t sit on the shelves for very long owing to its low-price point.